This recipe is supposed to be from the book Chakh Le India by Aditya Bal who hosts the TV show by the same name. The book was sent to us so we can read and try something from it before we meet the author and the host of the TV show. 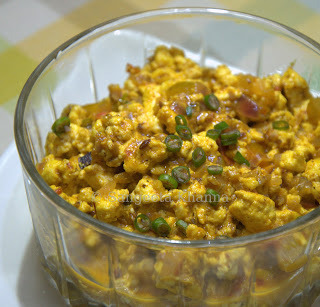 I tried this Amritsari Paneer bhurji the first thing form the book and was planning on Malabar prawns. Paneer bhurji is a recipe which cannot go wrong and any one staying in a hostel can make it for a quick meal. 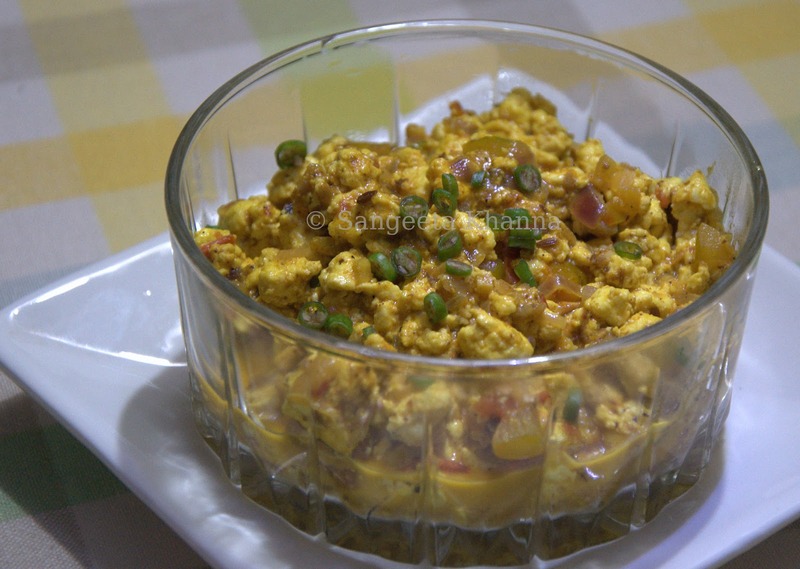 Toss anything that you like with Paneer and a nice bhurji that you love would be ready in a few minutes. Still we look out for more variations so there is a recipe for every mood and requirement. That's how we enjoy the same food a renewed interest every time. You don't expect to go wrong with a simple recipe right? I realised when I started assembling things for the bhurji, having made my paneer freshly., the ingredient list looked just sufficient for my 200 gms of paneer while it was listed for 400 gm. Was proven right later. To finish the dish...juice of 1/2 lime, 3 tsp chopped coriander greens ( I didn't have) and 1 tbsp butter. Crumble the paneer and set aside. Heat butter in a pan and add cumin seeds,dalchini and chopped onions all at once. Fry till onions gets golden brown. Add the chopped ginger too. Cook for a minute with the powdered spices added at this step. Add salt and sprinkle water and bhuno the masala while scraping the pan from sides. Add chopped tomatoes and cook them till they turn mushy. Add sugar to balance the sourness and keep cooking till a glaze appears. 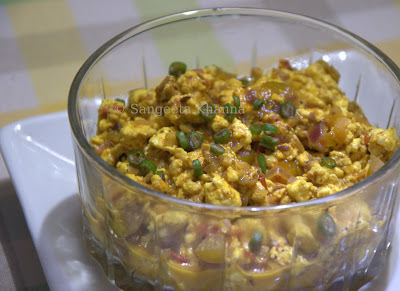 Add the green chillies, crumbled paneer and the amchoor powder (if using). Mix well to combine. Mash the paneer with the back of the ladle if you wish. Finish with some more butter, lime juice if required and chopped coriander greens if using. The recipe was tweaked at some places like using my own spice blend and using only butter instead of a little refined oil in the original recipe too. The amount of paneer reduced to half and the dish was actually yummy. The recipe as written in the book would have left the freshly made paneer (a valuable commodity as I had worked on it) bland and under seasoned. Did I forget about telling you all about Malabar Prawn curry that I was about to try from this book? When I saw the recipe and the ingredient list, I got worried about the future of the frozen Prawns I had bought thinking of making a yummy dinner for ourselves. I made this Cashew and Prawns stir fry instead. Couldn't afford to risk a packet of precious Prawns and even pricier Coconut milk. Heres the famous APB!! Looks so interesting. Mmmm ... am tuned in S!! Never tried aamchoor in Paneer - will try it once !